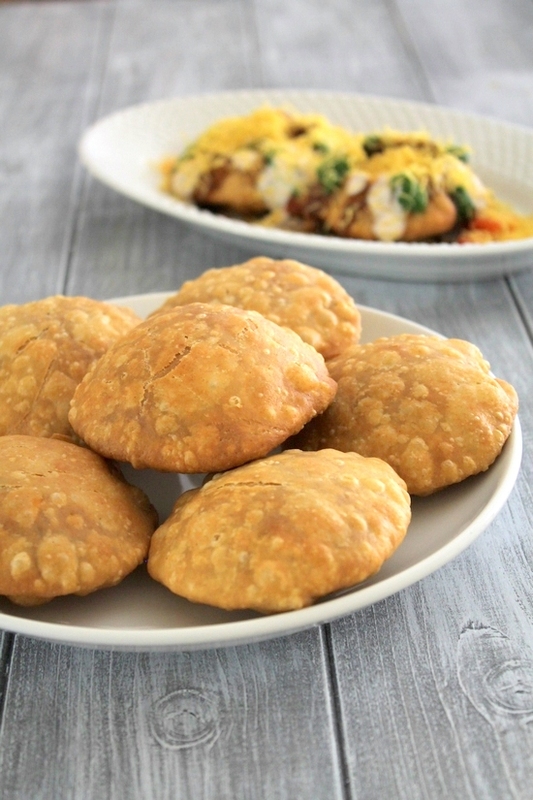 Khasta kachori recipe – it is deep fried, puffed pastry stuffed with spicy moong dal stuffing. 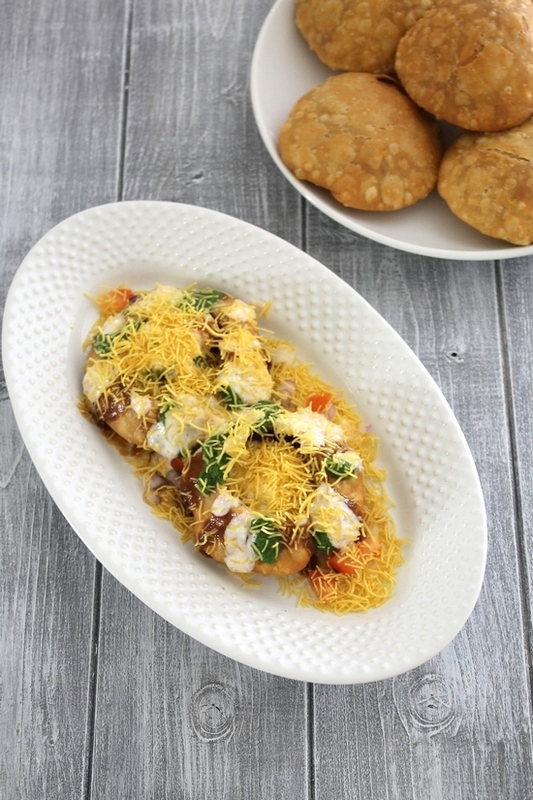 It is topped with chutneys, onion, tomato, yogurt and sev to make the khasta kachori chaat. ‘Khasta’ is the Hindi word. It means flaky. So these khasta kachoris have flaky and crispy texture. Different region has different pronunciation for the word kachori. Many calls it kachaudi, kachauri, kachodi as well. 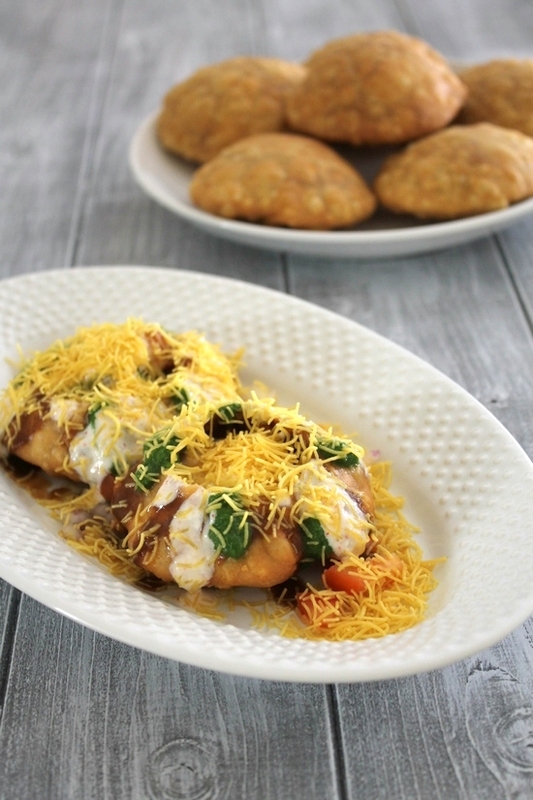 Just like other chaat recipes, kachori chaat has combination of different flavors, taste and texture. It has balance flavor of spicy, sweet and tang. Here I have made the stuffing from the moong dal. This is different method than usual moong dal kachori. No soaking is required. Dal is dry roasted and then ground into powder form. After that it is spiced and flavored with spice powders. Since we are not soaking the moong dal, the stuffing will be dry and free of moisture. So fried kachori will stay crispy and flaky for longer period of time (for 1-2 weeks). So usually make big batch, store in the container, and make chaat whenever I feel like. I always have green chutney and tamarind chutney in the fridge. So the snack will be ready in 10 minutes only. Instead of moong dal you can use split skinless urad dal as well. Other kachori recipe on the blog – matar kachori. The outer layer is traditionally made from all purpose flour (maida) only. But when I make at home, I have used half all purpose flour and half whole wheat flour (atta). So it is little on healthier side. In North India, khasta kachoris are served with aloo ki sabzi as a breakfast. Just like all other north indian breakfast dishes like chole bhature, aloo paratha, this one is also heavy on stomach. I can never handle this heavy food in the morning. Apart from the serving them as a breakfast, we can make khasta kachori chaat and have it as a snack. I have made chaat version and also shared the method. Dear hubby prefers the chaat over the aloo sabzi. 1) First we will roast the moong dal for stuffing. Take moong dal in a pan on low-medium heat. 2) Dry roast it with stirring constantly till it changes the color slightly. As you stir, you will feel the dal gets more crunchy. It will take good 8-10 minutes. 3) Remove it to the plate and let it cool completely. 4) Then grind into the powder using grinder or blender. 5) Add all the spices (red chili, coriander, cumin, amchur, garam masala, fennel powder, salt and sugar). 7) Add 1 ½ tablespoons of oil. 8) Mix well so everything is coated with oil. Keep it aside. 9) For the photo purpose I have shown the the yogurt mixture at this step, But while the roasted dal is cooling, make this yogurt mixture. Take chilled yogurt in a bowl, add red chili powder, cumin powder, black salt and salt. 10) Beat it till yogurt gets smooth and everything gets incorporated well. 11) Also make two chutneys. I have made them a day before and kept in the fridge. You can do the same or make in the morning if serving in the evening. 12) Now make the dough for the outer layer. Take all purpose flour, whole wheat flour and salt in a bowl. 15) Mix it by rubbing the flour and ghee using your fingertips. 16) It should be breadcrumb like texture. 17) Now start adding little water at a time. And make tight and stiff yet smooth dough. 18) Cover it with plastic wrap or cover with another bowl upside down. Let it rest for 15 minutes. 19) After 15 minutes knead the dough one more time and make it smooth. Divide it into 20 equal portions. Roll it into smooth balls and flatten it between your plam. 20) Work with one ball at a time. 21) Roll it into 2 inch diameter circle. 22) Place couple of teaspoons of stuffing mixture in the center. 23) Gather the edges and pinch it. 24) Now press it by your hand gently. 25) It should be sealed properly. 26) Now using the rolling pin again roll it very gently into 2-3 inch diameter kachori. Giver very gentle pressure while rolling. So outer layer does not break. If it breaks and stuffing comes out then it will make mess in the oil while frying. 27) Keep the rolled kachori on the plate on single layer. Keep it covered with kitchen towel. So it does not dry out. Roll all the kachoris similar way. 28) When you are about to done the rolling part. Heat the oil on medium-low heat for frying. Once hot slide the kachori carefully into hot oil. Slightly and gently press into circular motion using spatula. 29) It will puff up. Fry till the bottom is golden brown. There will be no more bubbles. Then flip it. 30) Again fry the other side till crispy and golden brown. Always fry the kachori on medium-low heat to make it crispy. If fried on medium high heat then it will get soft after it cools down. 31) Once fried from both the sides, remove it using the slotted spatula. 32) And put them on paper towel lined plate. Repeat the same for all the kachori. Fry few kachoris at a time, do not overcrowd the pan. 33) Right before serving, assemble the chaat. Prep all the elements (chopped onion, tomato, two chutneys, yogurt, sev) on the counter or work surface. 34) Take two three kachoris in a plate. 35) Break the top center part only, we will fill the kachori. 38) Next drizzle a tablespoon of tamarind date chutney on each kachori. 40) Then goes a tablespoon of coriander chutney on top. 41) Now drizzle the yogurt mixture. 42) Then lastly sprinkle the Sev on top. Serve the khasta kachori chaat right away. Otherwise crispy kachori will get soft and soggy because of the chutneys and yogurt. To store it for later use, let the fried kachoris cool down completely before storing. Otherwise the steam from the hot/warm kachori makes them soft. Fried kachoris stays good for a week in airtight container at room temperature. Serving suggestion: Serve the khasta kachori chaat as a snack. 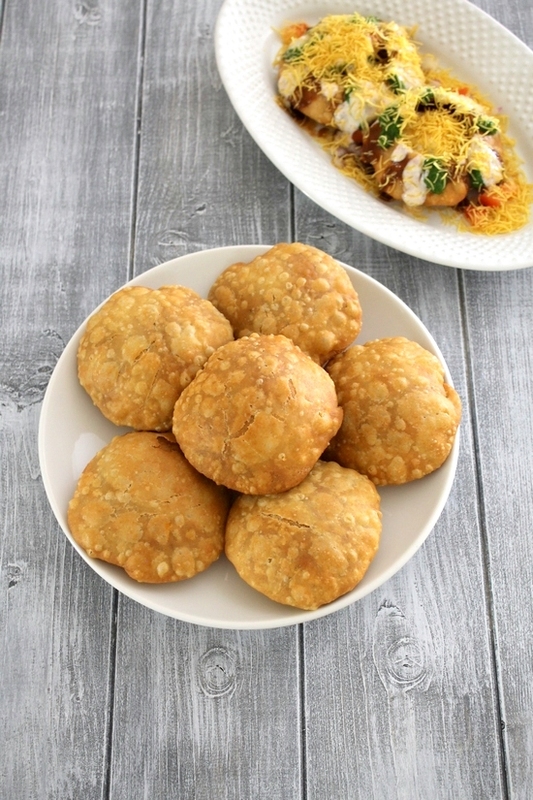 The kachoris can be served with aloo ki sabzi as a breakfast or dinner as well. Oil or ghee quantity should be enough vs. flour. This addition of oil or ghee is also known as ‘Moyan’ or ‘Moyen’. If it is less then kachori will be crispy but not flaky. Keep dough and rolled kachoris covered with kitchen towel to prevent from drying out. Be careful while rolling, be gentle, do not give too much pressure. Otherwise it will break and stuffing will come out while frying and kachori will break into oil. Then it will be big mess. Oil temperature should be medium for frying. To check oil is ready or not: drop a small piece of dough into hot oil, if it comes on top steadily then it is ready. If it comes on top immediately then it is too hot. If it comes on top very slowly then it is not hot enough. Do not fry more than 2-3 kachori at a time. Otherwise it will drop the oil temperature and then it will not puff up. Take moong dal in a pan on low-medium heat. Dry roast it with stirring constantly till it changes the color slightly. It will take good 8-10 minutes. Remove it to the plate and let it cool completely. while the roasted dal is cooling, make this yogurt mixture. Take chilled yogurt in a bowl, add red chili powder, cumin powder, black salt and salt. Beat it till yogurt gets smooth and everything gets incorporated well. Also make two chutneys. I have made them a day before and kept in the fridge. You can do the same or make in the morning if serving in the evening. Now dal is cooled to room temperature. grind into the powder using grinder or blender. Add all the spices (red chili, coriander, cumin, amchur, garam masala, fennel powder, salt and sugar). Mix well. Add 1 ½ tablespoons of oil. Mix well so everything is coated with oil. Keep it aside. Take all purpose flour, whole wheat flour and salt in a bowl. Mix well. Add ghee. Mix it by rubbing the flour and ghee using your fingertips. It should be breadcrumb like texture. Now start adding little water at a time. And make tight and stiff yet smooth dough. Cover it with plastic wrap or cover with another bowl upside down. After 15 minutes knead the dough one more time and make it smooth. Divide it into 20 equal portions. Roll it into smooth balls and flatten it between your plam. Work with one ball at a time. Roll it into 2 inch diameter circle. Place couple of teaspoons of stuffing mixture in the center. Gather the edges and pinch it. Now press it by your hand gently. It should be sealed properly. Now using the rolling pin again roll it very gently into 2-3 inch diameter kachori. Giver very gentle pressure while rolling. So outer layer does not break. Keep the rolled kachori on the plate on single layer. Keep it covered with kitchen towel. When you are about to done the rolling part. Heat the oil on medium-low heat for frying. Once hot slide the kachori carefully into hot oil. Slightly and gently press into circular motion using spatula. It will puff up. Fry till the bottom is golden brown. Then flip it. Again fry the other side till crispy and golden brown. Always fry the kachori on medium-low heat to make it crispy. If fried on medium high heat then it will get soft after it cools down. Once fried from both the sides, remove it using the slotted spatula. And put them on paper towel lined plate. Repeat the same for rest. Right before serving, assemble the kachoris. Prep all the elements (chopped onion, tomato, two chutneys, yogurt, sev) on the counter or work surface. Take two three kachoris in a plate. Break the top center part only, we will fill the kachori. Add chopped onions. Then chopped tomatoes. Next drizzle a tablespoon of tamarind date chutney on each kachori. Then goes a tablespoon of coriander chutney on top. Now drizzle the yogurt mixture. Then lastly sprinkle the sev on top. I have improved my cooking skills by reading many culinary books that explains food science and many cookbooks. Then I do try the recipes in my kitchen. I have failed many times in the beginning of cooking journey. But as I understand how ingredients works and got some experience, now I don’t get such fails. 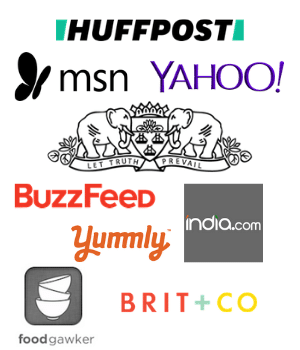 If you want book recommendations let me know I will give you the list. superbly detailed recipe. i like your style of explaining the recipe a lot and of course all the recipes are wonderful. i made kachori chaat as per your instructions and it was wonderful. thank you so much!! Very glad to hear that it came out good.